Accounting 24 Edition The authors of ACCOUNTING, 24e, understand that you need to find important information quickly. 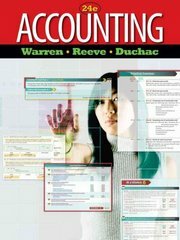 This textbook uses an integrated learning system to help you complete homework and lead you to accounting mastery. Built on the authors' proven approach, clear examples and high-impact writing style, you will be guided through the preparation of financial statements to understand accounting's evolving role in business.